Copyright 1999-2014 (c) Synthetic Reality Co. This is another useless demo program, and is a serious number cruncher with which to task your high powered computer. This program is FREE, not shareware. Just enjoy it. 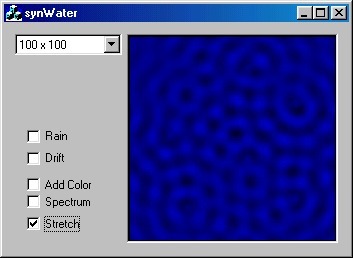 Aside from an interest in simulating wave action on the surface of water (remember those 'ripple tanks' in high school physics? ), I also was experimenting with higher color resolution DIBs. This program uses 16 bit color DIBs (and as a result probably won't run under NT, just to warn you). Only after I finished it did it hit me that only meant 5 bits of 'blue' and 32 shades is not as amazing a spectrum as I was idly dreaming about while coding it. Well, just download the executable and run it. Drop-down combo (100x100) for setting size of computation frame. This is an N-squared implementation, so you need a power computer for larger computation frames. Add Color: Tries to get more than 32 shades by mixing 2 hues. stretch: you can resize the window to any shape you like, but the computations will still be limited to the size you specified in the combo box. But turning on stretch means that the computation space is stretched to fill the current display size. A POWER user doesn't use stretch! There's really not a lot to this program. I like to think of the drip in the middle continuing to bounce up and down (initial weight of drip presses it down, then pressure of surrounding water fills in the depression but makes a little hill, which is then pulled back down by gravity which makes a valley and this repeats over and over becoming the foundation of the sinusoidal wave). And then slowly petering out, but each new ripple in the center makes a new circular wave front which propagates out from the center at a certain velocity, decaying in amplitude the further it gets from the center. So basically I wrote an equation which gives the elevation of an x,y location contributed by a single drip, then called it repeated for each possible x,y location in the computation space. Then I convert the elevation to a color and display it. Given that the inner loop (called 100*100*10 times in the default case) contains a squareroot, a sine calculation, and several multiplies and divides, it is clear to see why this is so slow! synWater is the property of Synthetic Reality and all rights are reserved. If we can figure out a way to convince people to pay for this, you can be sure we'll give it a try. But for now it is expressly intended to provide a moment of joy for the math geeks in the audience, looking for number-crunching programs to show off their power computers!